On Monday, the Blackhawks announced the roster that will report to training camp this week as Chicago looks to defend the Stanley Cup. While there weren’t as many departures after this championship as there were in 2010, there will still be some intriguing players on the ice when training camp begins. There will be 31 forwards, 19 defensemen and six goaltenders at training camp. Forwards Brandon Pirri, Jimmy Hayes, Jeremy Morin and Ben Smith are expected to compete for a roster spot on Opening Night, but many of these young players will return to either Rockford or their junior teams. Among the forwards at camp will be former first round draft picks Kyle Beach, Mark McNeill, Philip Danault, Teuvo Teräväinen and Ryan Hartman. On the blue line, top prospects Adam Clendening and Ryan Stanton will try to make an impression, while newly-added AHL veterans Michael Kostka and Theo Peckham and Dylan Olsen will hope to get some attention as well. Dillon Fournier and Klas Dahlbeck will also attend the camp. In net, the NHL roster appears to be set with Corey Crawford and Nikolai Khabibulin, but Antti Raanta will be trying to make Khabibulin expendable. Raanta, 24, signed in the spring and hopes to be playing in Chicago soon; of course, Crawford’s new contract means anyone in camp will be trying to earn the back-up role for the next seven years. There will also be seven unsigned free agents at camp including Joe Gleason, who was drafted by the Blackhawks in the seventh round in 2008. Click here for the entire camp roster. What can I say – I’m giddy with excitement that training camp will start in a few days and preseason games a week or so later. My kool aid runneth over. I’m calling it now – my darkhorse for training camp surprise is Maxim Shalunov. re: Mason Raymond – which kid is losing his shot at the NHL for Raymond? I would rather see what the Hawks have in Morin, Smith, Hayes & Pirri for less than $1M than throw money at a veteran maybe at this point. Nice player, but no thanks. Isn’t it time to update the picture at the top of this page to be a picture of the 2013 Stanley Cup Champion names?! Who is expendable if Adam Clendening has a good camp? I don’t really know why but I love LeBlanc. Seemed like he had great offensive chemistry pretty quickly in his obviously very limited action, but I like him. Defensively he probably needs work but I wouldn’t be compltely shocked to see him make it at some point this year. Tab………agreed!! We need to see what we have in the system. Anyone associated with the Vancouver Canucks is just a bad fit, anyway. re: who is expendable – kinda hard to be expendable when you have a no-trade clause. every defenseman on the Hawks has a NTC except Leddy & Hjalmarsson this year… and neither of them is leaving. Oduya might be asked to waive his next summer around the Draft, but the only guy that could go at this point is Brookbank. 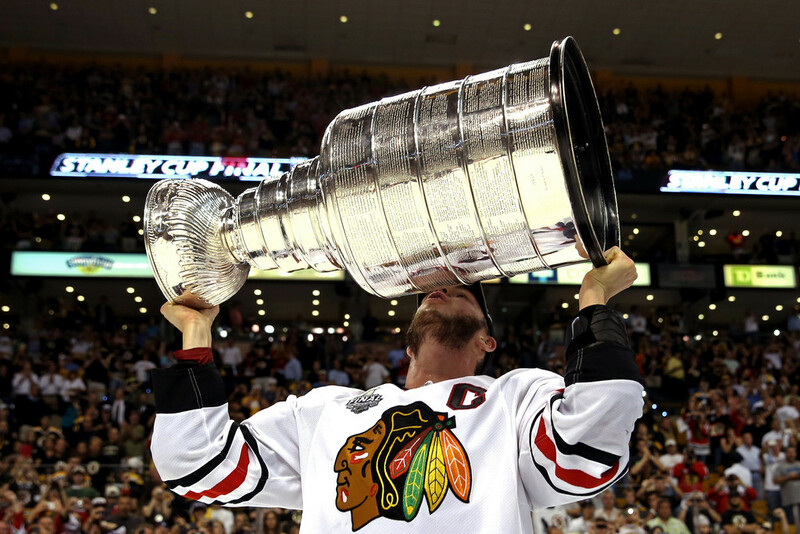 @ Montana Blackhawk: when there’s a photo of the new names engraved on the Cup it’s a consideration. I hope the Hawks website or CSN tapes or televises a bunch of these practices. I know we will probably have to wait a year to see more, but cool to see TT (at least for now) will be wearing #23 on his jersey. It’s been a few years since that # caused much excitement in this city. “Beginning in mid-September at her Montreal studio, after the trophy has finished traveling to wherever each player on the 2013 Blackhawks wants to take it, Louise St. Jacques will begin recording the latest NHL champions on the lowest of the trophy’s five barrel rings. Maybe when she finishes this year she will make a template, cuz there’s a good chance she will be engraving many of the same names next September, and the September after that, and the September after that… Go Hawks! I wonder why TT is going to wear #23 instead of his #86? ER- He is the Michael Jordan of Hockey!!! Daaaa!!! Hey boys………..I was lucky enough to get tickets for the Blackhawks/Sox game, last night. It was a very nice celebration, but I had a real nice 5 minute conversation with the kid, TT. He was just standing next to a booth, just kind of watching the entire parade / celebration take place. He was minding his own business and I just walked up to him and asked him his name……….LOL. In a HEAVY eastern/Netherlands accent he replied, but I could barely understand it……..LOL. He is a gentle soul and a nice, respectful young man. If he is 155-160lbs. he is lucky. He looked like an 8th grade kid…….LOL. John McDonough walked over and said “remember how Patrick Kane looked when he first got here”? I asked John very seriously, “is this kid even in the same league as Kane in 2007”? Without hesitating, John said, “he is the BEST player in Europe, right now and he will be an excellent pro player”. I think this kid is a year, or two away from playing in the NHL. He NEEDS to gain some weight and some size to his small frame. I tried to look for TT away from the puck stuff… Was really impressed with his anticipation IQ on the Offensive side! TT would help the PP- Instantly! It reminded me of the Gretzky quote- good players are always around the puck… great players skate where the puck is going to be!!!! The often Injured Bolland- was that type ( very high IQ, and always in the middle of big plays) we will miss the Rat this year- (yes, I know he’s another Cap casualty-and I agree w/ the move)- Just sayin. Teuvo = finnish version of the greek name “Theodoros” (gift from god), which of course is “Theodore” in english. Teräväinen = diminuitive form of sharp. Perhaps “sharpling” as in smaller, or in Blackhawks case, younger Sharp..
Esko- Mo ( or Eskimo)- Rosetta Stones’ got nothing on you!!! I stand by the prediction that Danault is up with the Blackhawks for good by Thansgiving. I am not optimistic on Pirri. I’m just not. Teuvo is going to be Wicked. I really like Danault too. I know some think Pirri takes the 2nd line center job, but I think Saad may stick there and a suprise like McNeil sticks with the big club on the wing.